strike” over brutal police attack last week. Union bureaucrats declared “support,” refused to strike. 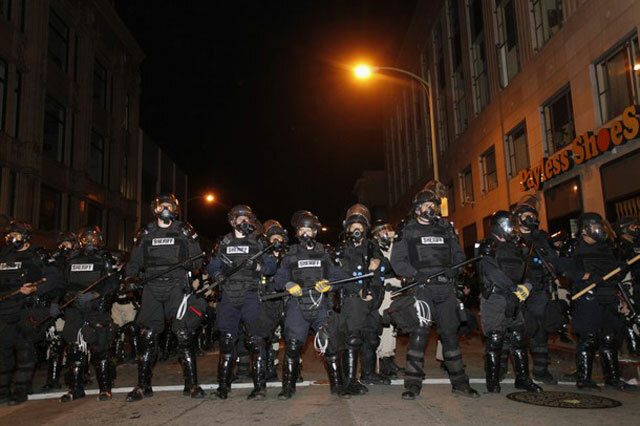 NOVEMBER 9 – When an army of hundreds of cops rousted the participants of Occupy Oakland in a pre-dawn raid on October 25, arresting nearly 100, a wave of anger swept the northern California city. And when police brutally attacked the several thousand protesters who gathered that evening to protest the eviction, repeatedly using tear gas and firing “less lethal” munitions at the crowd, it set off a firestorm of outrage. This turned into fury when it became known the next day that the police nearly killed a demonstrator, Scott Olsen, an Iraq War veteran, with a canister fired at point-blank range. On the evening of October 26, well over 2,000 people jammed into the square in front of Oakland City Hall, now renamed Oscar Grant Plaza, in honor of the young black man executed by a Bay Area Rapid Transit cop on New Year’s Day 2009. The General Assembly of Occupy Oakland voted, by a margin of 1,484 to 77, to call a general strike for November 2. The call electrified the city and the whole Bay Area. It reverberated around the country. Poor and working people saw a way to express frustration over the massive unemployment and escalating inequality that has continued to grow while bankers and other corporate chiefs rake in billions amid a world capitalist economic crisis. For the black and Latino population of Oakland, who together are the majority of this, the most ethnically diverse city in California, it was an opening to fight back against the racist police repression that is pervasive in Oakland. This was where in the 1960s the Black Panther Party for Self-Defense arose, in response to rampant cop attacks. Even many white middle-class residents wanted to express their disgust at Mayor Jean Quan, who was elected as a “progressive” Democrat, only to order the brutal attack on Occupy Oakland, and then pretend she had nothing to do with it. From the outset, it was clear to all that there would be a massive outpouring of anger on November 2 as thousands would take to the streets to denounce the cop assault on the occupation. But would it succeed in shutting down the city with a massive work stoppage? That depended above all on the response of organized labor. One after another, Bay Area unions announced their “support” for the action, but the labor bureaucrats were virtually unanimous in refusing to call on their members to stop work, citing “no strike” clauses in their labor contracts. Taking a personal leave for a day, joining in a late-afternoon march on the port and otherwise showing solidarity is well and good, but it’s a long way from a strike. For there to be work stoppages that would be a challenge to capital and its marauding racist police, it would depend on the rank-and-file. And that poses the central question of class-struggle leadership. As November 2nd dawned, all eyes turned to the waterfront, which was key. Even though ILWU International and Local officials vowed they would keep the port open, some younger longshoremen thought differently. One of them, Anthony Leviege, took the mike at the union hall to urge fellow port workers to not take jobs. Richard Washington, one of those who refused work, emphasized that “the rank and file workers decided not to work today in support of Occupy Oakland.” Long-time longshore militant Jack Heyman reported that this “effectively shut down the port this morning,” and a huge line of trucks waiting to be unloaded stretched from the port into the city of Oakland (see “Oakland Port Shutdown: Workers Refuse to Work the Docks,” The Internationalist, 2 November). The Oakland Tribune (3 November) quoted the chief wharfinger (manager) of the port of Oakland saying that there was work in some terminals, “but it’s really slow.” Stung by the reports, port authorities and union officials insisted the port was open, and scrambled to fill jobs. By noon the port was “limping along” at under half its normal pace. Altogether, while some downtown businesses closed, in the rest of Oakland industry and commerce weren’t greatly affected. The city government, which had said its civilian employees could take the day off, reported 5 percent out, which is undoubtedly undercounted, but even so, the large majority went to work. The Oakland School District reported around 300 teachers took a personal leave, about 15 percent of the total, but they were replaced by subs and other teachers held teach-ins. There were few union banners or contingents until late in the day, after work. But the crowds kept growing. What stood out was the composition: significant numbers of African Americans and Latinos, including many youth, reflecting the population of this heavily working-class city. And the sheer numbers: while Oakland police absurdly claimed only 7,000 marched to the port, and Occupy Oakland is saying 100,000, a more likely count would be something around 30,000-40,000, plus those who stayed at Oscar Grant Plaza. The police kept a low profile during the day. But soon after most demonstrators had gone home, some 400 police who had been mobilized from 15 jurisdictions around the region retaliated by attacking a building occupation near the Oscar Grant Plaza where Occupy Oakland is camped. The building was the empty former offices of the Traveler’s Aid Society, which had served the homeless, but was forced to vacate when the city couldn’t or wouldn’t pay the loan costs for the building. Several hundred people reportedly took part in the effort, seeking to turn it into a community center, but they were met with waves of riot police firing flash-bang grenades, beanbags and rubber bullets. More than 80 were arrested. The media the next day denounced “violence” – by the occupiers, for allegedly throwing rocks in response to this potentially murderous police assault. Once again, an Iraq war veteran, Kayvan Sabeghi, was badly injured, his spleen ruptured by police who beat him viciously and then held him in jail for 18 hours before allowing an ambulance to take him to the hospital. So tens of thousands of people march against police brutality and in defense of Occupy Oakland, and as soon as they leave the cops are on a rampage once more. The Oakland Police are an increasingly bonapartist force that chafes at civilian authority, even by the double-talking liberal Democratic mayor Quan, a former Maoist who has become a figurehead for cop terror. The OPD acts as an occupation force in African American and Latino neighborhoods of West and East Oakland. It is already under a federal monitor for police corruption and racism in a case going back to 2000. Last August the monitor reported that 28 percent of the time Oakland cops drew their weapons it was without cause, and in 95 percent of those cases the guns were pointed at African American or Latino “suspects.” In September a federal judge declared that the OPD and Oakland City officials still “don’t get it.” Soon after, the police chief resigned. But whether with federal monitors or receivers, or any other “reform,” the bottom line is that the Oakland police are a threat to the population, and they are incorrigible. This underscores the fact that what’s needed here is not a demonstration of public opinion, but the mobilization of working-class power against capitalism and its repressive forces. That begins, but doesn’t end, with real strike action. Ultimately, since police are the backbone of capitalist state power, it will take nothing less than a socialist revolution to get rid of cop brutality, which is endemic to capitalist rule. 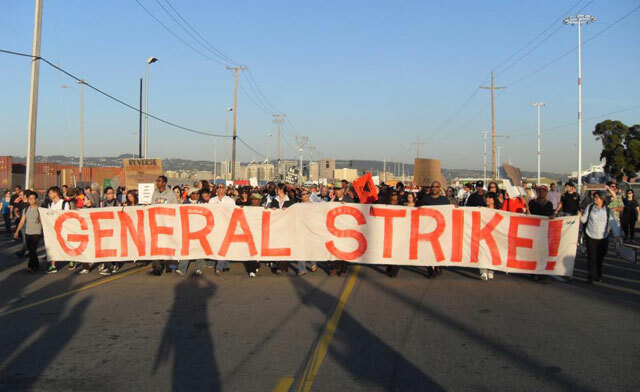 There hasn’t been a general strike in the United States since 1946, also in Oakland, which is no accident. Oakland is the home of the fifth busiest port in the United States, and the Bay Area is the home of the International Longshore and Warehouse Union (ILWU), historically one of the most militant unions in the country, a tradition that is still felt to this day. The ILWU itself grew out of the San Francisco General Strike of 1934. On May Day 2008, Bay Area longshore militants spearheaded the ILWU strike that shut down all 29 ports on the West Coast against the war in Iraq and Afghanistan. Even though a one-day action, this was the first-ever strike by American workers against a U.S. imperialist war. If anywhere in the U.S. a general strike is possible after more than three decades of unrelenting attacks on labor, the San Francisco Bay Area is a prime candidate. That most definitely did not happen in Oakland on November 2. Why not? First of all, because an amorphous group like Occupy Oakland, which is a collection of individuals on the basis of a shared sense of grievance, cannot carry out a general strike, even when it enjoys wide public support. An outside group like students can provide a spark, as in the French general strike of May 1968, but the actual strike can only be a collective action by the working class. That doesn’t mean by the union bureaucrats, who almost always resist any challenge to the capitalist system they are part of, and then try to sabotage it if forced by pressure from the workers’ ranks to carry it out. That’s the main reason why there are plenty of failed general strikes in labor history. A general strike can also be spearheaded by a militant opposition force within the workers movement. But in any case, to be successful it requires a leadership with a program and determination to wage class struggle through to victory. The ILWU activists’ October 28 leaflet, titled “Defend Occupy Oakland With the Muscle of Organized Labor,” concluded: “Shut it down.” The ILWU shut down the ports coastwide in 1999 demanding freedom for Mumia Abu-Jamal, and again in 2008 calling to stop the war on Iraq and Afghanistan. Local 10 has carried out numerous stop-work actions, most recently over the Oscar Grant murder and in solidarity with Wisconsin workers. But on November 2 ILWU spokesman Craig Merrilees told the press: “It’s virtually impossible for any union to endorse a work-stoppage because all contracts have no-strike clauses, which unions are bound to honor.” And when longshore militants on the morning of November 2 called on workers not to take jobs, the union tops worked hand-in-glove with Port management to find takers. In the face of a vicious attack by the Oakland Police, the pie cards worked overtime to keep the port running. So ILWU president Bob McEllrath’s statement of “support” for Occupation Wall Street is just hot air. The union tops’ insistence that the port was up and running was so emphatic, one might think a deal had been cut. Or are the ILWU’s lawyers so worried about court-ordered fines against the union over the resistance in Longview, Washington that they are desperate to show that the ILWU has a law-abiding, “responsible” union leadership? In fact, Occupy Oakland announced in calling the strike that it was doing so in “solidarity with Longshore workers in their struggle against EGT in Longview, Washington.” And it followed up the November 2 action with a letter to the corporate chiefs of the consortium that owns EGT, denouncing their union-busting. This apology for a betrayal by the union tops, not only by the ILWU but of all East Bay unions, reflects the program of supposed labor “militants” who share the fundamental outlook of the bureaucracy. It is nonsense that the unions can’t call for a general strike. Certainly the bosses’ courts may declare it illegal. Some union leaders might actually have to go to jail and the unions may be hit with huge fines. But the way to fight that is with even more powerful labor action, shutting down the whole of the Bay Area, bridges and all, with a real general strike. But that is inconceivable for the parasitic layer of labor fakers and for the reformist dissidents who would replace them. In the present period, where union gains are being systematically destroyed and virtually every effective tactic of labor struggle (mass pickets, flying squads, sympathy strikes) has been outlawed, trade unionism that plays by the bosses’ rules is doomed to fail. The only effective way to fight back is militant class struggle against capital and the capitalist state. Against Police Repression: Mobilize Labor's Power to Shut the City Down! So 40,000 people or thereabouts came out on November 2. 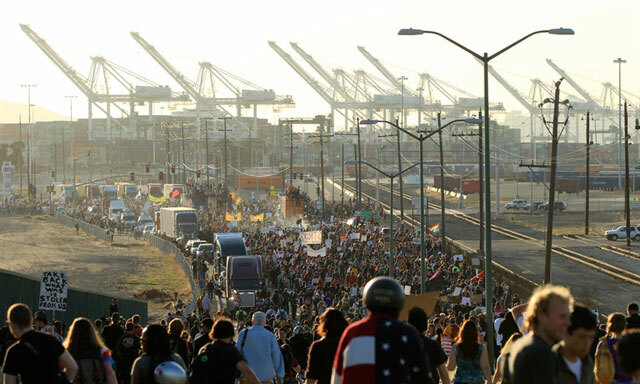 The Port of Oakland was shut down for several hours, though not by the action of the workers. A great time was had by all … and a couple of hours later the OPD struck again in order to show that it still ruled the streets. Not exactly a victory. A call for a general strike received wide support – except where it counted. The opposition of the union tops to striking qualitatively weakened the action. Still, the size of the mobilization gave working people a sense of their potential power, and the fact that the high point was a march on the Port of Oakland showed general awareness of the centrality of labor. The provisional balance sheet is mixed, but the key is what lessons are drawn from this experience. The first must be the need to oust the pro-capitalist labor bureaucrats, and break with the Democrats to build a revolutionary workers party that fights for a workers government. Early on, Occupy Oakland activist Cat Brooks spelled out for Reuters news agency the meaning of the call for a general strike: “We mean nobody goes to work, nobody goes to school, we shut the city down.” The union tops prevented this from happening, yet despite this stab in the back, you don’t hear any complaints from the organizers of Occupy Oakland. Why not? For starters, because they are working with the labor bureaucracy: the Alameda Central Labor Council didn’t call on its affiliates to walk out, but they did put on a great barbecue; the OEA didn’t strike, but they provided portable toilets. Nothing against cookouts and porta-johns, but they don’t stop rampaging cops. More fundamentally, the reality is that the politics of the “Occupy movement,” however vague, are no more radical than those of the misleaders of labor. The leading occupiers may mouth some “anti-capitalist” rhetoric and even talk of “revolution” from time to time, but in practice they, like the union bureaucrats, accept the confines of the capitalist state. When there is talk of a “general strike,” there are very different conceptions of what this means. For anarchists, the general strike is the social revolution. Moreover, for the followers of Mikhail Bakunin, the call does not have a class character: one fine day “the people” suddenly stop work and capitalist society grinds to a halt. For them, there is nothing problematical about a body like Occupy Oakland calling a “general strike,” it could just as well be called by students or shop owners. The anarcho-syndicalists seek to root it in the workers, but the basic conception is the same. Even for the latter-day Industrial Workers of the World, it means “deliverance from wage slavery”: “The General Strike, and the General Strike alone, can save Humanity from the torture and degradation of the continuation of capitalism” (Ralph Chaplin, The General Strike ). Such a miraculous day has never happened and never will. The idea of a general strike doing away with exploitation is what syndicalist “theoretician” George Sorel called a “mobilizing myth.” A strike alone will not end capitalism, the working class has to seize power. For some labor/socialist reformists, the “general strike” as practiced in Europe in recent decades has replaced socialist revolution as their maximum program. Yet such “general strikes” are nothing but one- or two-day demonstrations with work stoppages in the most organized sectors. Greece had a dozen in 2010, and The Occupied Wall Street Journal to the contrary, Greek workers didn’t win any concessions by these “general strikes.” They certainly are no answer to the global capitalist economic depression, but basically a means by which the labor bureaucrats let the workers blow off steam without threatening the system. Finally, when some liberals and bourgeois “progressives” talk of a “general strike,” what they mean is something akin to a paro cívico which is quite common in Latin America, a “civic work stoppage” which involves all sectors of society. But this is just another form of bourgeois pressure politics, along with popular-front street demonstrations, lobbying and the like. It is not a means of exerting workers power. There can be defensive general strikes and local general strikes in the context of hard-fought struggles. But there as well, a general strike ultimately poses the question of power. If a strike is aimed at ousting Mayor Quan and stopping the systematic, racist brutality of the OPD, what is to replace them? Another bourgeois politician, and yet another police “reform” (firing the chief, civilian review board, “community control” or other palliatives)? That will resolve nothing. Serious revolutionaries do not bandy about the call for a general strike as a panacea for every situation, as some on the left do. An effective general strike requires preparation. The Internationalist Group and League for the Fourth International have intervened in several situations where the need for a general strike was posed. In France last autumn, we raised from mid-October 2010 on the need for “a nationwide general strike until the anti-worker pension ‘reform’ is dropped” (“France: May in October? The Spectre of a New ’68,” The Internationalist No. 32, January-February 2011). In a discussion at a general assembly of labor activists in the Paris region, we stressed that it was necessary to call on the unions, the mass organizations of the working class, to call a general strike and at the same time to agitate for it among the ranks and among non-unionized workers. In fighting against the stranglehold of the bureaucracy, we noted that local inter-union coordinating committees can be transformed into elected strike committees (see “Eighth Day of Action in France: The Unions and the “Interpro” Assemblies” [4-6 November 2010]). In Wisconsin this past February and March, as a huge mobilization of labor broke out over a union-busting bill, we argued from the outset (February 18) that beyond a statewide public workers strike, “It will take nothing less than a statewide general strike” to defeat the labor-hating governor. As this call began to catch on, in a second leaflet (20 February) we called to “Prepare to Strike Wisconsin!” When a local labor body called to approve a general strike, we emphasized (22 February) that what was posed was “a contest between labor and capital over which class shall rule,” and while in Europe one-day general strikes are often a way of diverting labor militancy, in the U.S. today, “even a one-day statewide strike could be a step in the right direction.” And when the rump legislature voted the law, we called “For a General Strike Now!” and for workers defense guards (13 March). Throughout, we underscored the need for revolutionary leadership and a class-struggle workers party. Instead of a general strike, the labor officialdom backtracked and called to channel the outrage into a drive to recall Republican legislators (and elect Democrats), which ultimately failed. Even if it had succeeded, the Democrats supported to the Republican governor’s budget including huge cuts in public workers’ benefits. In this betrayal, the union tops got a little help from their friends on the left. Just at the moment when a general strike was actually possible, the International Socialist Organization published an editorial (11 March) declaring that “calling for a general strike – no matter how enthusiastically it is received – is unlikely to get very far,” and calling instead for pickets before work or noontime marches. The ISO neglected to mention that its own members were among those who had been calling for the general strike. In the wake of the October 25 police assault on Occupy Oakland, we called for a massive mobilization of workers power against police brutality that would shut the city down. How this should be accomplished depended on the response of the unions. When a general assembly of 2,000 at Occupy Oakland called for a general strike on November 2, although this was not a workers organization, it responded to an urgent felt need for powerful labor action against the cops. From a distance, we encouraged militants in the key longshore union to shut down the port on the day of the “general strike.” Although there was little time to prepare, the formation of elected strike committees in key unions would have been appropriate, particularly as the bureaucrats’ refusal to call strike action became clear; and mass pickets led and defended by squads of union workers could have been organized at the port entrances. Today, mobilizing workers power against the rampaging police is still on the order of the day. In response to new threats of police action to evict the occupiers, there should be union-backed workers defense guards together with Occupy Oakland at Oscar Grant Plaza around the clock. An organized defense can help avoid unnecessary clashes with cops looking for an excuse to attack, and ensure that if they do attempt to dislodge or assault the occupiers, they will have to go through lines of union members, so that next time it really could provoke a citywide strike to shut the city down. As part of such an effort, occupiers and their defenders could study the Oakland general strike of 1946 and the history of mass political strikes, including the San Francisco general strike of 1934, and the Minneapolis Teamster strike the same year, led by the Trotskyists, which managed to prevail in the face of occupation by the National Guard. A general strike does not fall from the skies. Like any strike it is a collective action, not an individual choice. And after it is collectively decided, it must be prepared and enforced. Picket lines mean don’t cross, and effective strike lines are ones that no one dares cross. There must be systematic work in key sectors in order to give it the power to stop production and distribution. But above all, beyond organization, what is needed is a revolutionary program and leadership. The union bureaucracy will inevitably betray, and the bourgeois liberals will try to prevent any struggle against capitalism, private property or the police. This is already beginning to happen as members of Mayor Quan’s Block by Block Organizing Network are calling for Occupy Oakland to sanction “those who launch physical attacks on people or property.” Meanwhile, two business groups, Downtown Oakland and the Lake Merritt/Uptown District Association are calling on the mayor to exercise “bold leadership and forceful action” to stop the “unending social experimentation” of Occupy Oakland. In some respects, Occupy Oakland has been slightly to the left at least of Occupy Wall Street. A banner proclaims the “Oakland Commune” and some of the non-leaders describe themselves as communists, while at Wall Street many of the OWS “facilitators” are viscerally hostile to leftists. Early on, Occupy Oakland declared Oscar Grant Plaza a “police-free zone,” whereas Liberty Plaza (Zuccotti Square) in New York is crawling with undercover cops and the uniformed ones do periodic walkthroughs while everything is observed and recorded from a NYPD watch tower. An October 29 Occupy Oakland statement on the upcoming day of action included, “Against an economic system built on imperialism, inequality and corporate power that perpetuates all forms of oppression and the destruction of the environment.” But despite a few rhetorical touches, Occupy Oakland is politically the same anarcho-liberal-populist mixture to be found elsewhere in the “Occupy movement.” Not only does this leave the door open to right-wing Tea Party elements (notably Ron Paul supporters), but also to the law-and-order liberal “moderates” who are now reportedly seeking to police the movement against Black Bloc anarchists, building occupiers and anyone else who would lay a finger on sacrosanct private property or resist cop attacks.